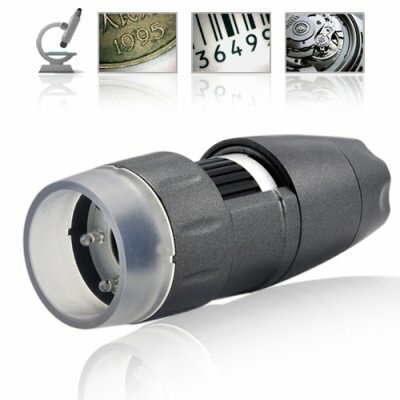 Successfully Added USB Digital Microscope with 300x Magnification (Handheld) to your Shopping Cart. New USB Digital Microscope with 300x Magnification is the latest edition to our famous USB Digital Microscope family of products. This new handheld model has all the video and picture capture features you love along with a manual rotary knob allowing for an amazing 300 times zoom so you can closely examine fine details on any object you are interested in examining. In addition to viewing the images on your computer screen, with the included capture software you can also record all the details as either still pictures or video for later review. This is a must-have computer accessory for any small business that needs to examine merchandise or objects closely, and is available from your factory direct wholesale source - Chinavasion.com. Order yours today and we will ship it out tomorrow. The image sensor inside this product is made by Sirius. You can find Sirius USB 2.0 Camera drivers on many software download sites. So, if you are an expert computer user you may be able to get this product to work with those Operating Systems. I am a Macintosh OSX user. I have been playing with my microscope for three days now. I plugged it into an intel chip Mac and it just worked. It works in iChat (installed on all macs) as well as many other free or public domain image capture programs. Some of the better mac OSX applications include BTV Carbon and BTV Carbon Pro (both trial software), hTV app(a bit idiosyncratic but anyone geeky enough to be interested in the underlying Unix commands then this is a MUST), VideoViewer (which works back to OS10.2, and is incorporated into OSX10.6.5 and higher), macam (probably the most flexible app, it allowed me to capture MPEG4 AVI encapsulated video through Quicktime directly. I did have trouble with connecting it to a PPC chip mac (2006 and earlier) as they do not recognise the USB 'device' but I forced it to read the USB port as if it was a "VimicroUSB PC Camera Altair" vs 9.00 and it worked. I tried a few other common Webcam drivers but they didn't work. It was plug and play on Windoze XP SP2 and SP3. I have not tried it on Windoze Vista or 7. I have seen the EXACT same model at other Chinese websites at twice the price! (not the only thing). And previous model is available in an Australian retail electronic stores for over USD100!!!!!! on 2010-03-21 10:21:24 Great Product! Excellent retail package, nice design and easy to use. FYI: Can be used with a MAC in Photo Booth, no software needed for this operating system. AWESOME!!! Highly recommend for detail work. on 2010-01-22 23:42:29 Amazing device !!! Product work like a charm great quality ! Got a great feedback from my drop ship customer. He said "Great microscope at a fantastic price" THANK YOU GUYS!